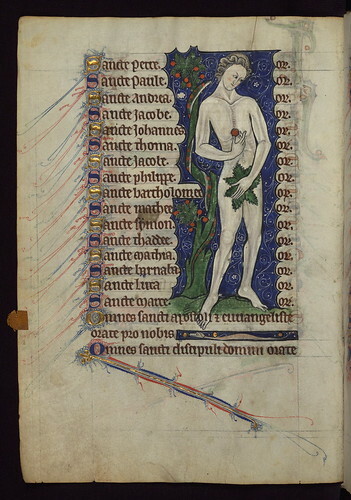 Book of Hours, Adam, Walters Manuscript W.102, fol. 28v, originally uploaded by Walters Art Museum Illuminated Manuscripts. This is a finely illuminated and iconographically rich Book of Hours, made in England at the end of the thirteenth century. The manuscript is incomplete and misbound. Its main artist can also be found at work in a Bible, Oxford, Bodleian Library Ms. Auct. D.3.2, and a Psalter, Cambridge, Trinity College Cambridge Ms. O.4.16. The manuscript contains a number of unusual texts including the Hours of Jesus Crucified, and the Office of St. Catherine. The patron of the manuscript is not clear: a woman is depicted as praying in many of the initials, but rubrics in the Office of the Dead mention "freres". The imagery is marvellously inventive, and the Hours of Christ Crucified are graced with images depicting the Funeral of Reynard the Fox in its margins. In the absence of a Calendar, it is not possible to locate the origin of the manuscript precisely.